Naptime, wooden blocks, and finger paint have returned to Capitol Hill as politicians debate the fate of Head Start – a kindergarten readiness program that targets children from low-income families. 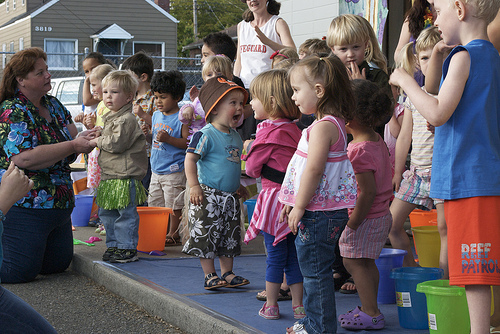 Due to sequester spending cuts, 70,000 young children will be denied access to Head Start. Additionally, 14,000 staff members will lose their jobs, causing an economic ripple effect in already struggling communities. These seemingly detrimental losses have brought Head Start into the public view, raising questions about the necessity of federally funded preschools. The Heritage Foundation, a conservative pubic policy organization, recently published a report analyzing the benefits of the Head Start program to students as they continue their educations. Heritage’s analysis, based on a study released by the U.S. Department of Health and Human Services, found that by the third grade, children who participated in Head Start had no significant advantage over other students. Given these rather underwhelming results, the program’s yearly $8 billion budget needs a second look. The question at hand is twofold: does the government have a legitimate interest in preparing children for kindergarten and, if so, does the Head Start program give students the most bang for the tax-payer buck? Many argue that doing something is better than nothing, especially for disadvantaged children. Assuming there is such a role for these programs, achieving quality education in the classroom should be the primary focus. When the HHS Department released its long-awaited report, however, the results did not leave much room for optimism. Although individual Head Start teachers surely provide support to any given child and his struggling family, the program as a whole is at best mediocre and economically inefficient. Regardless of whether these mediocre results are rooted in the familial and economic disadvantages common among these students or in the program’s fundamental flaws, quality should be the government’s primary goal – especially where tax dollars are concerned. If the experts find, contrary to the original HHS report, that preschool is essential to the success of young Americans, then privatization may provide a higher quality education for young children. Among the myriad of ways the government could ensure better quality while saving money, a public private partnership is one option for the future of the Head Start program. Instead of a federally managed program, a voucher system would give impoverished parents the option to choose a nearby school that would ensure better quality for the dollars spent. Privately run schools respond to market demand as charging tuition empowers parents to hold schools accountable. Each child costs the government approximately $8,000 per year in a Head Start program. Although many preschools are more expensive, they typically range from $3,803 to $13,480 per year, potentially cutting the cost per child. Additionally, the voucher system would ensure a higher quality education and would increase enrollment in schools, remedying some of the economic loss due to cutting Head Start. Head Start could also be privatized into a non-profit to raise public awareness of poverty while simultaneously ensuring quality education. Although this may reach a smaller population than the voucher program, it could act as a supplement to vouchers or to for-profit preschools. Based on donor sponsorship, a private non-profit could reach those who would not enroll their children in private preschools due to financial constraints. A non-profit incarnation of Head Start would give Americans the opportunity to give generously to a charity of their choice instead of mandated tax dollar spending by the government. These possibilities need to be explored by education experts to ensure the most efficient use of taxpayer money. If the benefits of preschool programs justify the expense, politicians should be open to a private-sector solution. Ensuring the opportunity to live the American dream by investing in the futures of young citizens is a noble goal. Giving them a “head start” that would be otherwise impossible makes good sense, but those in Washington need to first determine whether the government has a substantial interest in doing so based on the effectiveness of the program. Although no one wants reality to deflate theoretical dreams, ideas must be reconciled with results. Tags: Capitol Hill, Education, government, Head Start, Head Start Program, Heritage Foundation, Poverty, preschool education. Bookmark the permalink.